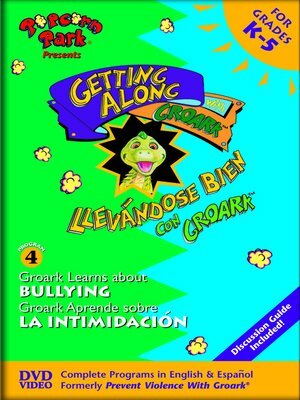 "Getting Along with Groark" is a 5-episode video series that teaches young children valuable lessons that will help them get along well, work out conflicts fairly and peacefully, and treat each other with respect. Funny, entertaining, and emotionally engaging, these videos combine puppetry, real children, music, and fanciful visual elements - a sure hit with young kids.In each episode, Groark, an affable, childlike dragon, gets into a tense situation with some of his friends. After he discusses the problem with his adult companion (ventriloquist Randel McGee) and a group of real elementary school children, he applies what he has learned and succeeds in bringing about a peaceful, positive resolution.In this episode, "Groark Learns About Bullying," Groark is playing with his friends when Burna and Muggsy start teasing and picking on Nubbs by stealing his hat. As the situation escalates Groark gets drawn in, and, before he realizes it, Groark is picking on his own best friend. When Nubbs calls Groark a bully, Groark doesn't understand what happened until he learns from a group of real children how he and the others were being bullies, and how hurtful that was to Nubbs. Groark returns to the playground, convinces Burna and Muggsy that they have been cruel and unfair, and together they apologize to Nubbs.Each video in the series is about 28 minutes in length. A teaching guide is included providing discussion questions, writing assignments, and fun group learning activities.Closed Captioned. For grades K-3.